Sczerbaniewicz’ practice involves an insatiable fascination with interior and often, uncanny architectural spaces such as tunnels, mine shafts, catacombs, fallout shelters, basements, crawlspaces, and myriad other forms of Subterranea. Drawing upon these marginal spatial subjects Sczerbaniewicz constructs intricate psycho-geographical vignettes-which excavate the latent historical, phenomenological, sociological, or political strata inherent within their substrates. 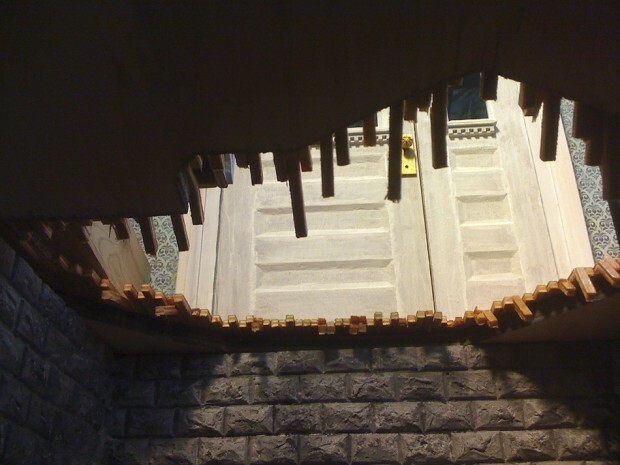 His immersive installations employ scale shifts and theatrical or filmic stagecraft; while advocating for direct, physical, viewer insertion and multi-sensory engagement. Through this level of immersion Sczerbaniewicz seeks to disorient the viewer in an attempt to subvert the staid and often detached, passive, and conventional approach to consuming artworks. He asserts that it is only in this hermetic space where authentic communication between artist and viewer occurs. Gary Sczerbaniewicz received his BFA in Sculpture from the NYS College of Ceramics at Alfred University and his MFA from the Dept. of Visual Studies at the University at Buffalo in 2013. He was recipient of the Jacob Kassay MFA Award (2013) and was a 2010 member of the NYFA Mark Program. He has recently completed a two-month residency at Sculpture Space in Utica, NY, where much of the installation entitled ‘Tom Ridge’ was created. Gary currently lives and works in Buffalo, NY.